With the fast pace and high stress of modern life many people are becoming interested in the peaceful philosophy of Buddhism. In particular there is a very deep interest in learning how to meditate, both to overcome stress and anxiety, and to deepen one’s spiritual experience. In response to this growing interest Kadampa Buddhism offers many different ways of learning about Buddhism and practicing meditation. 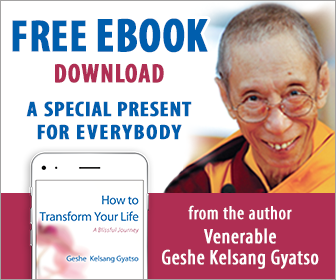 Kadampa Buddhism was first introduced to the West in 1976 by the renowned Kadampa Buddhist Master, Venerable Geshe Kelsang Gyatso. Since then he has worked tirelessly to provide all the conditions necessary to support contemporary practitioners. He has written nineteen authentic books on Buddhism that are now being translated into many different languages. Geshe Kelsang has also established over 1100 Kadampa Buddhist centers and study groups in 40 countries around the world where people of all cultures can train in meditation, mindfulness and other Buddhist practices.